Discussion in 'Transformers News and Rumors' started by Lucas35, Sep 28, 2018. Very nice artwork these comics have. Poor Diabla blew a fuse. Oh oh hope they didn\'t die :c I would love to see them in future movies! These Decepticons are so cool! Especially Runabout and Wildrider! Darksteel is cool too! I think you see her body fly away to the right so I hope she survives it. 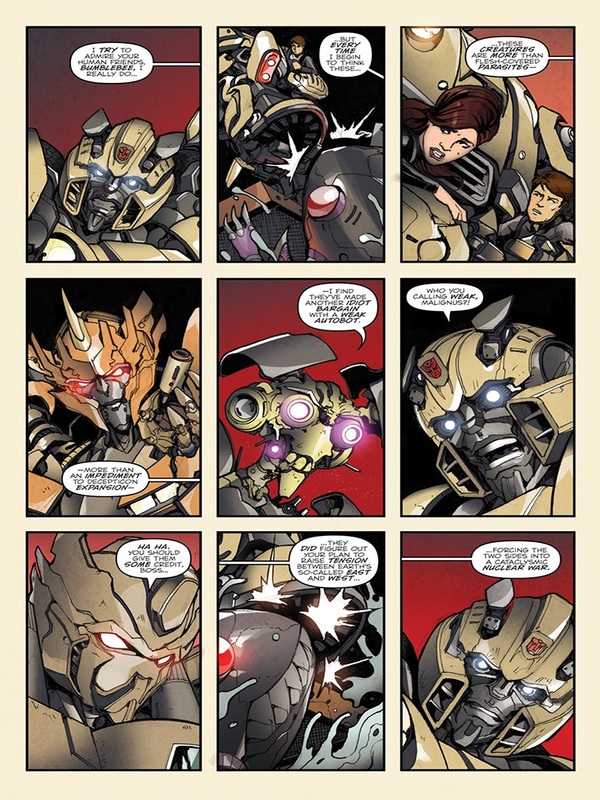 I'm glad bumblebee looks nothing like in this comic. And what's the point of this "prequel" comic if it's not canon at all to the movie? It's hard to tell from the explosion, so it's safe to say she burned rubber. C'mon a 007 love letter and NO ONE took the consideration to come up a few Bond Post-Mortem one-liners? i like the g1/movie hybrids we have there. i don't like that the big bad boss is rotf wheelie but with rabbit ears. I like to think it's intentional because ROTF was hated by everyone so why not make a Wheelie lookalike whose design sucked and make him into a pathetic looking villain. Bond had Oddjob who was a little person with a razor sharp bowler hat. It's promo stuff. They rarely accurately tie into the movie. So at least the writer is having fun with that, taking advantage of the freedom, and making a fun story in the process with tons of nods from all over. Though it also still could too. But art does often change. Aesthetic doesn't determine continuity. 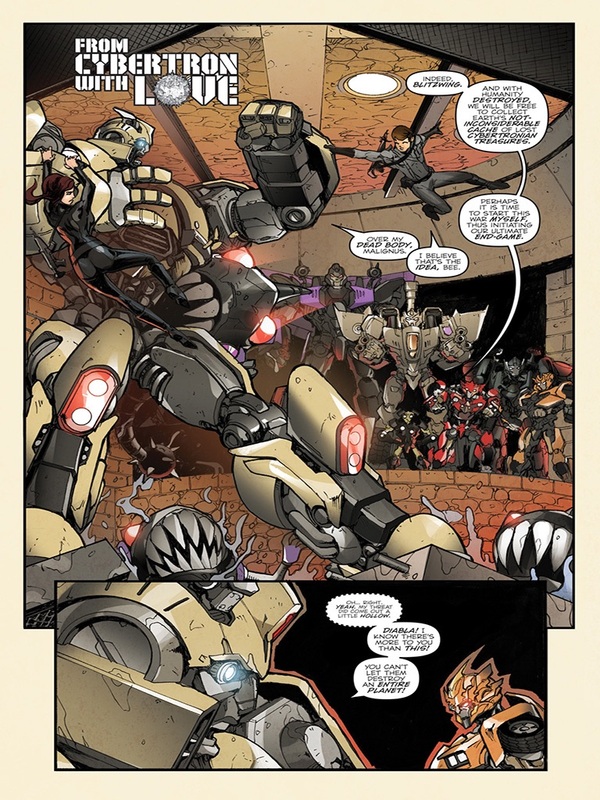 Like how we saw various aesthetics and styles throughout IDW's one transformers universe run. Marketing hype is about creating buzz. If you really expected this to be movie continuity, then you really weren't paying attention to all the previous times they've done this or any company has done this. It's a relatively new thing that sometimes comics are counted as continuity to motion media. With really only being the case with Marvel's MCU and their tie-in material. And even that is iffy and could change at any time in the future if they need to do something else on screen that they didn't think of for their tie-in comics at the time. Bumblebee's trailer references he took some memory damage so he may not remember this adventure entirely either. It's also foreshadowing much of what's in the movie, like how Bee is working with human government agents here, and how Blitzwing and Shatter do in the movie as a contrasting element. So while this may not be a real prequel to the movie, it may still be a prequel to the movie based comic, or a reshuffled IDW movie-verse comic universe. So sit back, enjoy the read, and go see the movie. That's really all this is for tbh, to get you hyped up for the movie and to be a fun read, with potentially more expanding off of it later if it does well enough. Honestly the only thing I really like about this comic is Malignus. Barber really went for the obscure there, and I love it. 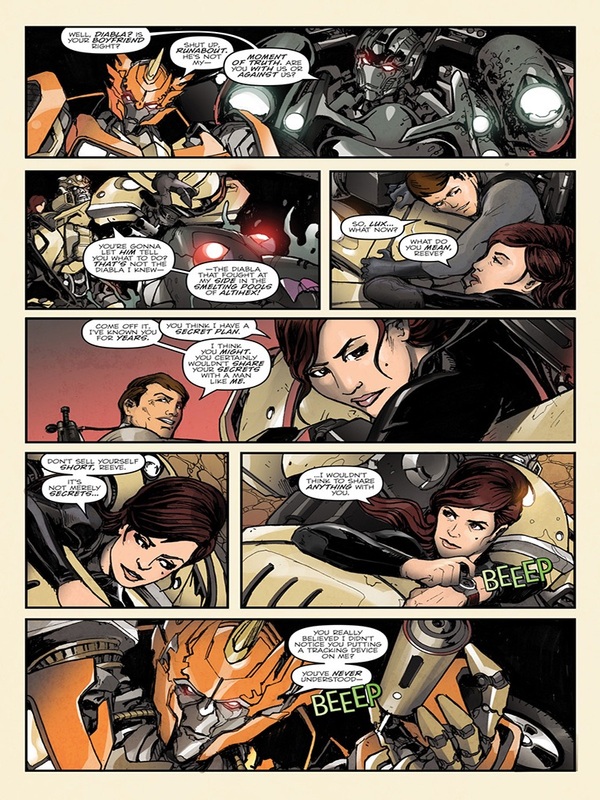 Dead or alive, I'm just glad Diabla was even in this comic at all, because it gives me hope that we'll be seeing more characters from the cancelled Universe game in the future. It would be such a shame if so many new and interesting characters were just thrown away and forgotten about instead of turning up elsewhere in the franchise.